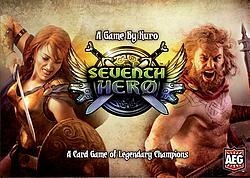 The card deck in Seventh Hero consists of 77 cards, with each card representing one of seven different heroes. Players each start with two random heroes, and each hero has a special power that can be activated once. Each turn, a player sends a card from his hand face down to the next player, who can choose to take it or pass it on. If he takes it, he adds it to his group of heroes, but if it's a hero he already has, both hero cards are sent to the discard pile. Before sending a hero away, the player must obey the current round's limitations, such as the card must be odd or must be below or above a certain number.